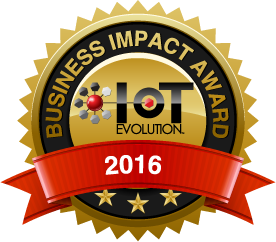 Boston, MA, July 19, 2016 – Powerhouse Dynamics, creator of the SiteSage® enterprise asset and energy management system, today announced that it has been honored with the IoT Evolution Business Impact Award for 2016. Presented at the IoT Evolution Conference in Las Vegas, the Business Impact award recognizes companies and business leaders who have successfully implemented IoT (Internet of Things) solutions. The Business Impact award recognizes Powerhouse Dynamics’ groundbreaking work in connecting equipment in commercial facilities into a single platform that delivers a range of benefits including improved equipment maintenance, reductions in energy and water usage and, in the case of food service organizations, enhanced food safety. SiteSage delivers a comprehensive solution that fully leverages the Internet of Things. In particular, the award honors the company’s achievements with Arby’s Restaurant Group, Inc., where SiteSage technology has been rolled out across all 1,000+ Arby’s company-owned restaurants. At Arby’s, the SiteSage platform connects HVAC, refrigeration, cooking, and irrigation equipment to cloud-based analytics and controls to ensure operational efficiencies and energy and water savings, along with enhanced food safety, consistent product quality, and reduced product shrinkage. Arby’s has reported 15% energy reduction in company-owned restaurants since 2011 while also achieving significant water savings. SiteSage, in use at thousands of restaurants, convenience stores, retail stores and other small commercial facilities across North and Central America, combines enterprise-wide equipment controls with granular monitoring and patented analytics to deliver the type of benefits that have been seen at Arby’s. The SiteSage connected equipment platform is being used by a growing number of HVAC, refrigeration, oven, fryer and other manufacturers to deliver equipment that is factory integrated with SiteSage. Last month, together with Arby’s, Ecova, and Weathermatic, Powerhouse Dynamics was also awarded the Environmental Leader Top Project of 2016 for a water conservation pilot program that saved over 7 million gallons at Arby’s locations, enough to fill 11 Olympic-sized swimming pools. And in May, Powerhouse Dynamics was named the 2016 Green Business of the Year by the Newton Needham Regional Chamber for achievements in energy savings and reductions in food waste, as well as for the company’s focus on sustainable operations.